There has been more progress made on the building in the village. We anticipate it being all completed within the next couple of weeks. It will be nice for the congregation to be sheltered from the sun, wind, and rain. 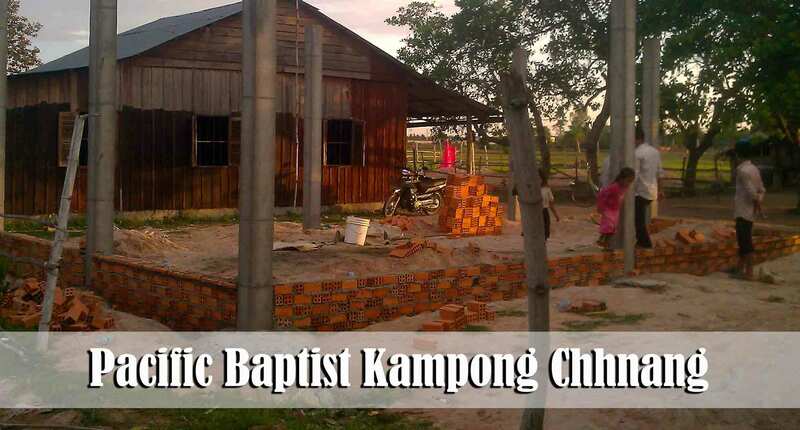 Ooeun and his wife, Srey Touch, and their children have begun attending the village church. Ooeun professes to have accepted Christ when he was a teenager but admitted that he has been away from the Lord for the past 10 years. This past Sunday they traveled to Phnom Penh to attend the morning and evening services. They enjoyed being here and we enjoyed having them. We are still not clear on their salvation so please help pray with us about that. This is the first new family that has started attending since the church was driven from the Cham village and relocated to the new village. We hope that there will be many more new families in the future. 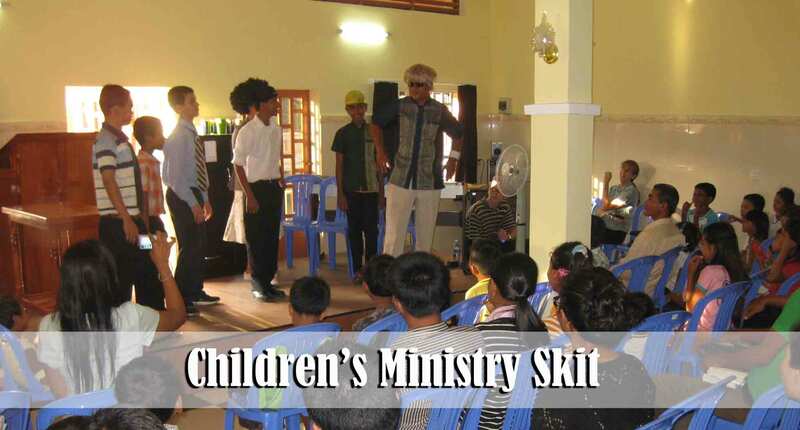 Several weeks ago we began having skits every other week in the Saturday Children’s Ministry. Though the skits are only about 10 minutes long, they add an exciting new dimension to the service. Each skit features a “grandpa” who is tempted to do wrong. This past week he decided to skip church to go and exercise with his friends. Much to his dismay the church soul-winners, while on their way to church, just “happened” to be walking past the park where he was exercising… he tried to no avail to hide but the pastor saw him and confronted him… the skit always ends up with grandpa “crying” (which is a huge hit with the children). He then repents and gets right. Jason and Jeremy are both part of the skit ministry. Bro. Bounna is doing a fantastic job leading this new ministry. The one-on-one discipleship with Sok Eng and Khema is going great. We are studying through 2 Timothy together each Saturday evening. Khema’s studies as a 4th year medical student keep her extremely busy as does Sok Eng’s responsibilities at the English school where he teaches. Lord willing, their schedules will adjust in a month or so which should allow them more flexibility to be involved in some of the ministries of the church. Please continue to pray for this young couple. We believe that God will use them greatly for His purposes. This past Monday we had an all-day workers training at the church in Phnom Penh. We were encouraged to see how God is working among these folks. We only invited 20 adults participate in the training. We taught on three specific topics but spent the majority of the time teaching them in regard to the “direction” and “purpose” of our church. I also spent time dealing with the Biblical qualifications of a pastor and deacons. I let them know that the time would be coming, sooner than later, when we would be calling a national to pastor the village church. Even now we are taking some steps toward that goal. It is very important that the folks do not rely exclusively upon the preaching, teaching, and leadership of the foreign missionary. I also dealt with the topics of dress and music. It is encouraging to lead a group of new believers who are willing and committed to believe and practice whatever principles are found in the Bible. I did not sense any type of resistance as we addressed these two topics head-on. In fact, these young Christians were astounded to hear some of the samples of “Christian” Khmer music that is popular here in the vast majority of the churches. We also reminded them that our Phnom Penh church is committed to planting additional churches. We do not have it as our goal to gather hundreds of people together for services each weekend. We intend, by God’s help and leading, to continually be sending families out of the church to help participate in planting other works in and around Phnom Penh. Most of those who participated in the training will help plant other works in the months to come. The spirit was good and the folks seem to be excited that God will use them for His purposes. Please continue to pray for us as we win souls and cast vision. Lord willing we will begin officially holding services in Prak Pnou within the next two weeks. We presently have about 15-20 folks who are prospects in that village. Five or six of the teenagers and adults have made professions of faith. Others are still not saved. Prak Pnou is only 13 miles outside of Phnom Penh and we currently run a Tuk Tuk there each Sunday morning to pick folks up and bring them to Phnom Penh to come to church. Additionally, myself and 4 of our men go to that village every Tuesday. Pray for some new Khmer prospects in this village who are not yet saved but seem to be open: Kunthea and SreyRoeuth. This village also has a good number of Vietnamese immigrants. This past week we met a young man named Vanna (about 25 years old), as well as Tu and his wife, Yong (in their late 20’s). While they only read Vietnamese, most of the Vietnamese in this village can speak basic Khmer which makes it possible for us to communicate with them. We would like to see a work established that can effectively reach the estimated 1,000,000 Vietnamese immigrants in this country. Brief update on my back: I have resumed a normal schedule for which I am thankful. Apparently the two disks are still herniated but they are not putting pressure on the nerve. There has to be some treatment done to help try to ensure that I can avoid surgery. There is currently no credible way to treat herniated disks here in Cambodia. The Lord has opened the door for me to get treatment with a Christian doctor in the States. I anticipate getting that treatment in August while we are in the States for a brief period of time. Thank you for praying for this situation. The neurosurgeon here in Cambodia as well as in the States was totally convinced that without surgery I would never regain strength and motion in my left foot. However, I would estimate that I have regained about 95% of the sensation and strength. We know that is due to the prayers of God’s people. Brief update on Ai: You will recall that in our last update I asked you to pray for 14-year-old Ai who was hospitalized. I had erroneously reported that she was suffering from an aneurism. In reality we came to learn that she has Meningitis. The doctor did not give the family very much hope. Apparently many children die from Meningitis in this county. After two weeks in the hospital we are happy to report that Ai has experienced a complete recovery! Brief update on the situation in the Cham village: The entire village joined together to drive our church out of the village but they failed to realize that “church” is not a location. The CHURCH is PEOPLE! I think they were under the assumption that if the location where the church met was forced to change then the people would stop believing in Jesus. They were wrong. Since the church has gone to the new location the persecution has continued. In some regards it has escalated. In recent days the village chief has divorced his wife because she refused to renounce Christ. Even as I type this update another one of our very faithful Cham ladies is going through the pain of having her husband divorce her because she has rejected Islam and continues to believe in Jesus. Monday after our workers training was done one of our members received a call stating that her husband had just sold all the cows, taken all the money, and is trying to find a way to sell their land. These are just two examples of the stand that our brothers and sisters are taking for the Lord. I surely hope that we are all upholding them in prayer. Please continue to pray for the new evangelistic outreaches in the following areas: Toul Kork, Stung MeanChey, Prey Prang, and Kandal.